A nice mixture of news and bonuses today! "I just cancelled my BMO Air Miles MC, I have had it for 5 years but the most recent changes to the Air Mile Redemption rate is unacceptable to me." Thanks to long time Rewards Canada reader Randy M for passing along this note. Looks like WestJet is ready to add another code share partner: Qantas. According to Airlineroute.net applications have been made to both the U.S. and Canadian transport agencies. Right now it appears that Qantas will code share on WestJet flights but there is nothing mentioning WestJet codesharing on any Qantas flights. Enough Air Miles bashing today, here is an easy offer for some free Air Miles. Be sure to check your email for this offer as they may ask for your personalized email to ensure your were targeted. 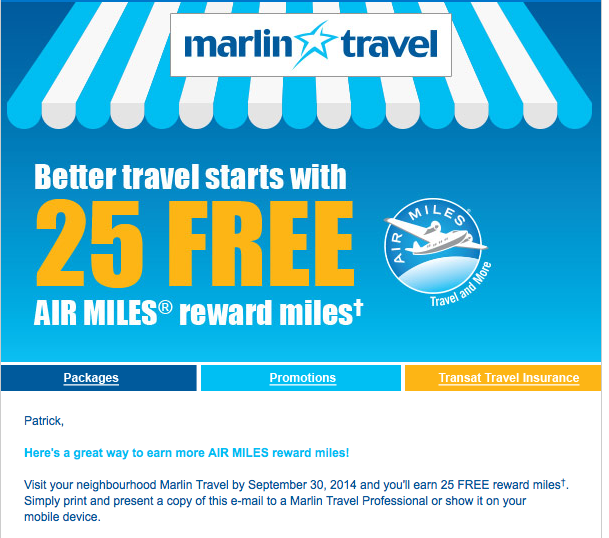 The offer is for 25 Free Air Miles simply by visiting a Marlin Travel. I'm sure they'll pitch you on something else while your their but all you'll have to say is no and ask for your free miles. Finally, there is another discounted award night offer to let you know about, this one is from Carlson Rezidor Hotels Club Carlson and offers 25% off award nights in Canada, the U.S. and the rest of the Americas. See the bonus offer section for more details. Yup, after not finding low-miles options for air miles travel redemption (most came up as high rate 25%+ more miles) I cancelled my BMO MC. I've stopped shopping at Safeway/Sobeys. Pretty much not going out of my way to collect air miles other than free miles.